Hello, all! I want to apologize for my disappearance this week. No matter much I love college, I will NEVER get used to weeks full of tests and stress, stress, stress. To sum it up, I’m having the kind of week where I want to hug the person who made sticky notes and I feel like my pillow has become a long lost family member. Also, why is it that the weeks I need it the most, my brain decides to go on vacation? Do you ever feel like that? Anyways, I’m still alive! 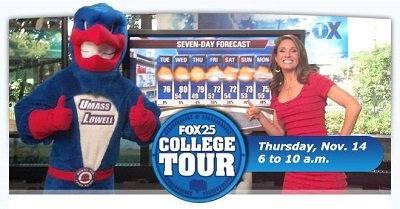 Even more important, I have some wonderful news: Fox Boston will be broadcasting the morning news live from our home turf! On November 14, they will be at the Campus Recreation Center on East Campus from 6:00am-10:00am for a Campus Tour stop. Wake up early, show your support, spread the word, and wear blue! Go River Hawks!